Festival season encompasses all of our favorite things, wrapped up into one long weekend. Whether it’s a chill block party, an avant-garde art expo, or an epic music festival, you can always count on great fashion. There’s something about trendsetting styles mixed with insouciant attitude and creative expression that’s simply magical. Our number one priority when putting together looks? Lightweight pieces that’ll keep us comfortable in the crowds. To see how we’d dress three unique style personas, keep scrolling. If comfort-meets-cute is your vibe, this look is for you. Throw on your favorite white tank and a pair of high-waisted shorts. We love a great paper-bag waist, because it helps cinch you in without being restrictive. And since your outfit is bound to be documented on social media, we suggest adding a pop of animal print for extra panache. Polish off the look with a pair of sunnies, and toss your belongings into a carry-all crossbody. Flowy maxis are to festivals what ice-cold drinks are to hot summer days—a no-brainer. Go with bold graphics, bright colors, or both to keep your staple item feeling fresh. Bonus points for a breezy silhouette that adds an extra bit of oomph to all your dance moves. Accessorize by stacking on beaded jewelry and complete the look with a bamboo bag to really capture the bohemian flair. Calling all denim lovers. Centered around a classic jeans-and-tee combo, this look tugs at our heartstrings because of how simply chic it is. A bold graphic top is laid-back and cool, and the contrast of light and dark gives the look edge. 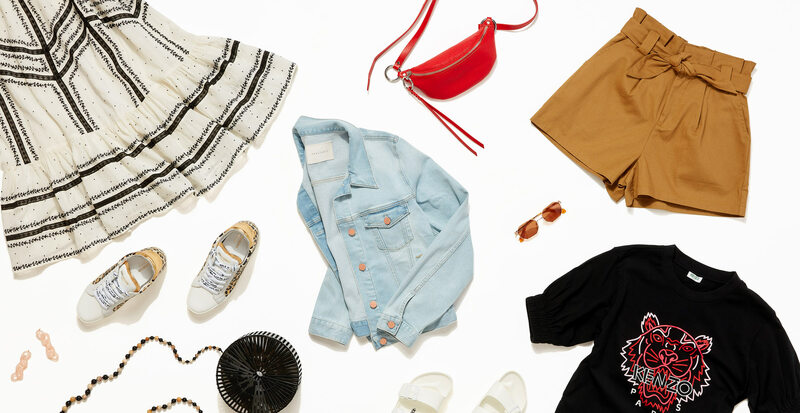 The best part about this ready-for-anything outfit is that you’ll be comfortable whether you’re squeezing through crowds, standing in long lines, or dashing between stages. Pro tip: Wear your fanny pack diagonally across your chest for a street-style touch.